David lives at 52 degree North latitude in the UK -- a pretty tough location for solar water heating, but his homemade system works quite well. This is a really nice build with lots of good ideas and details to learn from. Very nice workmanship and details. Solar heat is stored in the existing house thermal storage tank (which is used for both space and domestic water heating). An aesthetically pleasing collector and mounting arrangement. A pumping station that is mounted in a weather protected box on the back of the collector. A freeze protection system that takes into account his unique circumstances. Dave is a professional plumber who now teaches plumbing, and this shows in the attention to detail in the design and the careful workmanship. Thanks very much to David for sending this in! The copper riser, aluminum fin collector under construction. 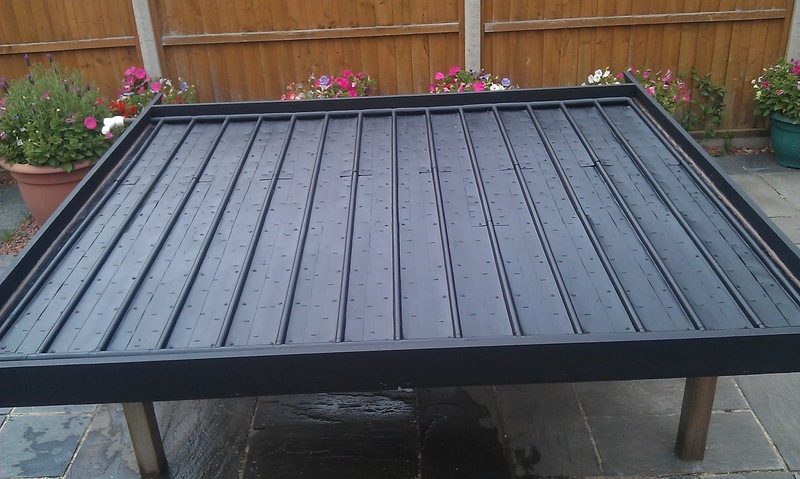 is used for space and water heating and now stores solar heat as well. Nice on David. Beautiful panel! I live in Warrington, somewhat north of yourself and share your concerns about the weather. Hi Mike. Thanks for the positive comments. Have you gone homemade? You only live about one degree north of myself so would be in the same situation. It would be nice to be blessed with more frequent sunny sky's. Let's hope for a good summer. Regards David. Hey David. I'm still building my system. I bought three evacuated tube panels, (47mm x 16), for peanuts off of ebay. I'm going to put them on the roof. I'm adapting an old, (free), oil tank which will sit at the side of the house. I have a 50m coil of 25mm pex for the heat exchanger. This is effectively the 'cold' feed for the combi in the loft. It's been a lot of work to say the least! Sounds interesting. What pipe are you using from your panel to your heat store? You've got lots of hurdles to overcome. Shame the heat store couldn't go in your roof space to provide a bit of frost and wind chill protection. Hope you'll put your design on BIS? I would recommend putting a single check valve on the main before it goes into the heat store. 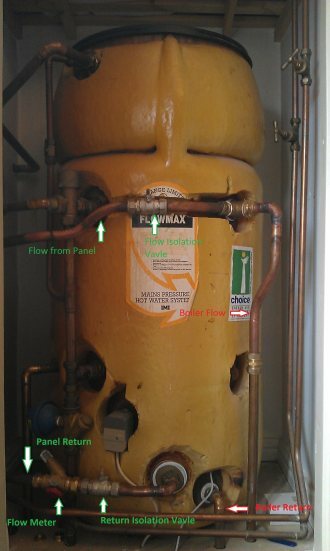 If you do you would have to put a small expansion vessel on the cold feed before it enters the boiler.Are you planning to use this over winter ? How bigs your heat store? Is your combi boiler solar compatable? Will it be blended before it goes into your combi? Lots to think about. Mines worked well today. Not had any other energy source for my hot water which is wonderfull. Good luck with your project. Sounds fascinating. I hadn't thought about an exp vessel :-/ The mains will enter and exit the tank in 15mm. I'm using a pair of 25mm x 15mm brass stopcocks to transition to the pex. I've had stainless pipe strengtheners made for the job, which fit snugly inside the pex. The hot then goes thru the wall into the house and up into the loft. I've plumbed in a combisol valve. If the water is >38C it adds mains cold as required and diverts the flow to the hot output of the boiler. If <38C it adds mains cold, mixing down to 25C, and diverts the flow to the 'cold' supply of the boiler. I haven't actually got a boiler as I'm refurbishing the entire house. I'll probably buy a solar compatible one anyway. The 12V controller is fed from the same spur that will feed the boiler. The 12v cables run back down to the tank for sensors/pumps and there's also a 3-core to the controller displayed downstairs. The tank will hold about 400 litres. I could have put a 200l tank in the loft next to the boiler, but I just don't fancy all that hot water up there. It'd be expensive too. Much safer outside, vented and all 12v. 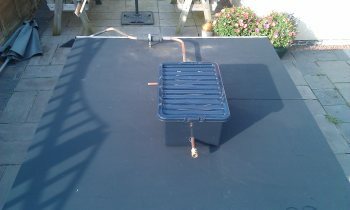 I'm keen to generate a lot of warm water, all year round, rather than hot for the three seasons. I'm planning to send 10mm up and down to the panels, on the side of the house. It won't look very pretty but heyho. 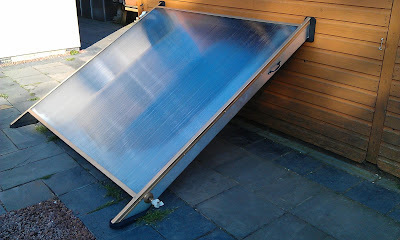 I haven't given the solar heat exchanger much thought yet. I have an old stainless steel towel radiator, which might well suffice. I've just had alook at the combisol. Looks a good bit of kit. Where are you putting the pump station? Will this be in the loft? If the flow and return might look abit unsightly could you not put them in a dummy downpipe? Copper flow and returns or stainless? Evcuated tubes are fantastic about 35% more efficent than flat plate. To heat 400l through 30 degrees requires 14kwh. Mains water temperature at the mo is about 11 degrees. I've run 6mm singles down to the tank position. I plan to put the 12v 7w pump inside a cabinet on the side of the tank. I have a compact exp vessel and PRV from a scrap combi boiler. I planned to use a simple gate valve to control the flow speed. I acquired a 25m coil of 10mm copper for £40.00. That should get me up and down the gable end to the panels. A soil-pipe is a brilliant idea! Allowing for armaflex 13mm insulation, the two pipes would comfortably fit inside 110mm soil. Vaillant state a gross collector area of 1.29sqm and a net of .8sqm for each panel. I'm not sure that three of these is sufficient. I only want to set up the scaffold and get on the roof once, so I need to get it right. It should fit into a down-pipe, eg rainwater. 63mm you could also make it look like it was connected to the gutter or run the 10 mms through the guttering with an outlet and seal the hole up around the flow and returns where it goes through, if theres gutter above. What did you mean with the 6mm's? I use the isolating valves to control the flow. I've been looking at flow rates and there is varied opinion. Gary gives a rational view on it in the measurements section which makes sense. Ideally you need different speeds for different panel temps so that would mean a modulating pump. I've not got one of them in my shed so I'll stick.I need to experiment with mine to get the best out of it. I done some calcs recently and it was working at 47% efficent at 2l/m. I've upped the flow speed to 4l/m so need to do so calcs when i'm around . Anytrhing over 50% with a homemade panel I'll be pleased with . You should achieve far great than this with your evacuated tubes. Whats the total surface area of your panels? I read your document of your setup about a week ago. It was a good read. Looks nice but have one question. I think at the time it stated your panel is insulated with polystrene insulation or something similar. IT did not say polyiso. So it seemed to be an insulation that would not hold up to a panel that got to the ~95C you had in your panels. Could you clarify the insulation. As I currently understand it you insulation would melt in stagnation events. It does have a thin wood protector that would help during short term stagnation but long term I could see a pile of goop(formerly insulation). It could be a mix up in terms, or different term usage here in USA vs UK. No it's not polyiso. It's a product called Jablite low lambda polystrene. I've been on the website and it upto 80 degree c so a bad choice in my design. I'll extract a piece from the pump station and put it to test. The insulation is covered over with 6mm ply so hopefully that might protect it a tad. The back of the panel does feel like theres any voids so touch wood. Do you have a self build project? Curiosity got the better of me at the weekend so I extracted some insulation at the top of the panel with a holesaw. The top 1mm had gone crusty but nothing more. I took some samples out of the pump station and tested them in oven bags at various temperatures up to 200 degrees c. It didn't melt but shrunk to about half its size. I think the 6 mm ply is acting as a good insulator. I'll re check after summer and if needed replace it with better insulation. The armaflex I've seen Dave, has a 13mm wall, so with 10mm bore, that's 36mm. I was thinking the feed an return would fit side by side in a soil pipe. I've got three evac panels. Sixteen 47mm tubes each, so just under 4sqm gross area. The 6mm electrical cables carry the 12v supply from loft to pump. You need a big square section of copper to carry 12v any distance. I took several, in anticipation of plumbing in a 12v 3-way valve for a heat dump. The 7w pump is max-ed out at 6lpm, so it shouldn't be a problem reducing flow with a valve, as you say. That what I used, 13mm armaflex. It's easy to apply. I used abit of cooking oil to make it slide over the pipes easier and installed it without spilting it over the majority of the pipework. Got it from e bay. If you don't achieve the heat gain you want in your store you can always fill it to reduce the volume so you bettter building it bigger than smaller. With you with the 6mms. Do you have a good gasp of electrics? I was hoping you would be willing to answer a few questions, as I intend on building a Thermal Store and Solar Panel.